I received this book for free to review. I did not finish reading this book. In the Tudor Court of 1518, your friends and enemies can be one and the same...During the annual celebration of the Order of the Garter, Sir Michael Devereaux arrives in King Henry VIII's court on a mission for his benefactor. The celebration's endless feats and sumptuous women delight the charismatic newcomer, who becomes captivated by the enigmatic Princess Renee of France. But evil, it seems, has followed Michael to the court. Shortly after his arrival, an unknown killer claims several victims, including the Queen's lady-in-waiting, and the powerful Cardinal Wolsey asks Michael to help with the investigation. As he searches for the killer, Michael is haunted by disturbing images of the victims - flashes of violence that lead him to doubt his own sanity. Michael soon realizes that the key to solving the crime is connected to both the Pope's Imperial vault in Rome and a mystery from Michael's own past - revealing a secret that is so damning, it could forever alter the future of mankind. However, I had to put the book down immediately upon reaching the fiftieth page. (My rule is to always read at least 50 pages of a book.) I don't even know if the plot was plausible or well-crafted, or if the characters were realistic and interesting. Why? Because I was so utterly and completely distracted by the language. As a fan of historical fiction, I believe very strongly that authors should make readers feel at home in the time period. I don't like anachronisms showing up in the story, and I don't like errors in language or historical accuracy (at least, not ones that I can spot). And I do feel that authors should write in the language that their characters would have spoken. There is a limit, though, to the number of times the word "forsooth" should appear in a chapter. In flipping through the rest of the book, I also think there should be limits to the number of aquatic references made in relation to parts of the anatomy. Maybe it works for other readers, but it didn't work for me. 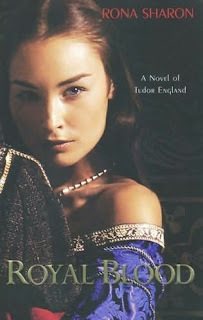 Rona Sharon is a very popular author, and I do think it's great that she is so true to her period that she uses "forsooth" as often as the Tudors must have. But I realized pretty quickly that this is just not my kind of book, and I don't think she's an author for me. But if anyone really enjoys historical paranormal novels, then this might be for you! If you think you'd be interested in this book, there is a trailer for it here. I was offered this book and turned it down. Sounds like I made a wise choice. LOL! I am slowing down on the number of ARC I accept to try to get through the ones I have. There are still some that I just can't refuse thaogh and this one was a bit tempting. Teddy, I'm completely with you on the ARC front. I'm getting a bit overwhelmed and may not accept any more for a few months. There are other books to read, after all! This time, LT sent me two books to review, and I had one from Vine as well, so it was definitely a busier month. This one sounds like it had a lot of issues. I don't think I would enjoy this book either, from the sound of it. Thanks for the honest review though, and I'm sorry this one wasn't to your liking. This book sounds really good! Too bad you didn't like it. I probably wouldn't either, so I am not going to give it a second glance. Hmm, I think I'll pass on this one. Thanks for the review! I don't usually go for paranormal or vampire books but I was thinking about getting this one from the library. If I decide to read it, I definately think that is the route i will go! I actually just finished reading this book and absolutely loved it! The language was indeed a bit difficult in the first few chapters, but I found it appropriate for the time period and quickly got used to it. I really enjoyed reading this book. It was such a page turner. Couldn't put it down. I was incredibly impressed by the level of historical detail and totally fell in love with the characters. Plus, the action and romance were great. Aarti, I wish you had given the book another few chapters... I would highly recommend this book.